the mummy, the photographer & the wife: you got PUNKed! I have never participated in a serious photography contest before, I guess I'm just lazy. 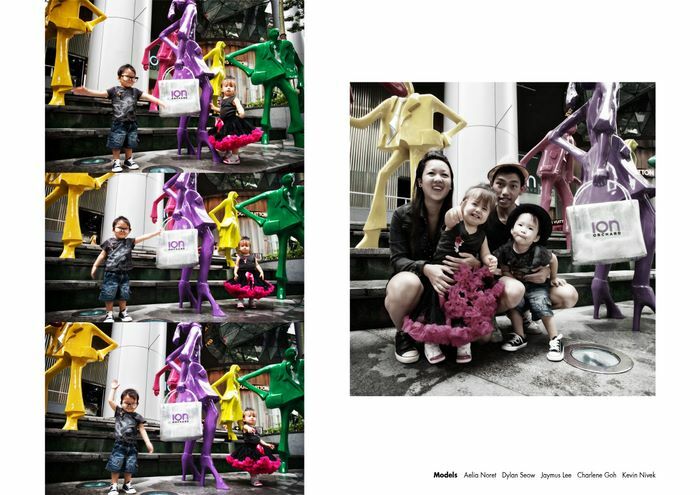 A magazine I am advertising in alerted me to a photography contest they were running together with ION Orchard. So just for fun (ok ok the prizes were quite attractive!) I thought I would take part. We had to do a fashion shoot on location at ION. I know nuts about fashion and had no access to professional adult models so I thought why not use kids (my own plus a couple of my Little Big Shots clients) as my models and my staff Charlene and her boyfriend Kevin also modelled for me. Pupsik Studio very kindly loaned us the pettiskirt for the shoot and Poppletots provided the rock themed pins for the kids. We had big plans after we recce the building a few days before. I wanted the characters of the shoot to be a punk rock family. I wanted to bring down my small amplifier together with my husband's electric guitar and get a kid's size drumset so they would look really cute with those props! BUT we had only the few of us and no extra hands and limited time, so we scrapped the idea of the props and just went ahead with clothes and the pins. As luck would have it, it RAINED heavily that morning we scheduled to shoot. So we had to shoot indoors instead. We decided on a very challenging shoot on the long escalator inside of ION. I must say it paid off! The shots indoors were great! We had a little accident with Jaymus but thankfully he's ok. They say never work with kids and you know how true that is :p Dylan refused to be near Jaymus and bawled his lungs out whenever we put them near each other. Aelia was all smiley whenever we were NOT shooting :p Char and Kev did well :) And thanks to mummies Cyrene and Davilia for helping out with the shoot especially Davilia who helped hold the flash. Come work for me again next shoot, haha! Just to wish you Good Luck! The shots are great, i love the ones on the long escalator!!! very nice :-) love them all. Was trying to call you both on your mobile and shop, appreciate if you can return my call at 9108 3055 (Laurel). Thanks. 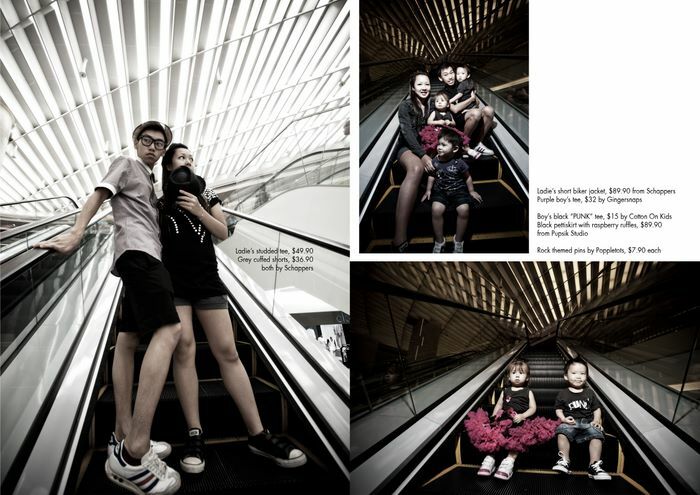 I love the pix of the first pix of the 2 kids on the escalator. Never saw ion that way. That is so super cool Maryann. When we return to Singapore, I would love for you to shoot a family photo of us at ION!